Hey Friends! So...things might be a little on the slow side this month - both on the blog and on the knitting front, because once again I've decided to partake in my second Fibrations event as a vendor this August! So exciting and yet so stressful, as sewing for my booth hasn't really commenced yet! I foresee a lot of really late nights...and coffee. Plenty of coffee this month! I had so much fun at last year's Fibrations that I decided that I just had to do it again this year! Even if I don't sell a single bag, it's just inspiring to be surrounded by a community of fibre enthusiasts, and I love meeting and talking to people who I only come across online. That there is a small zippered box bag AND a drawstring project bag in one of my most favourite prints ever, the "knit stitch" by Betz White. And yes, that's the exact same fabric as the large box bag that the Yarn Harlot has (as seen here) of mine! 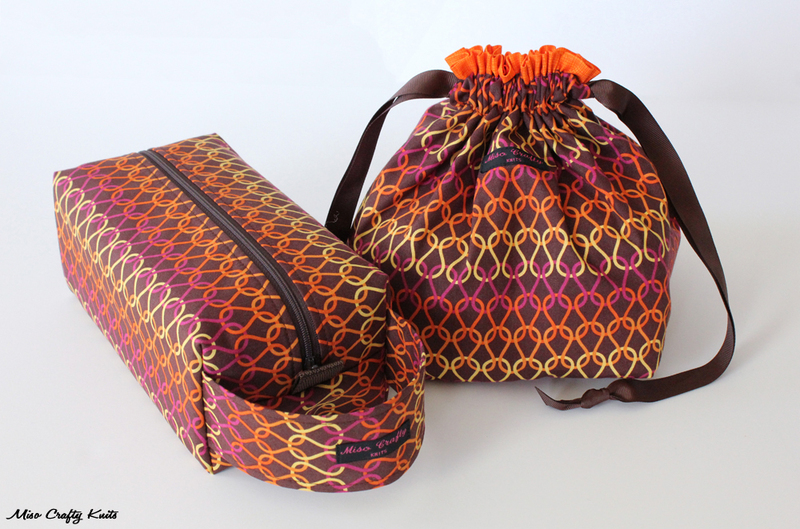 How awesome would it be to score not one, but two project bags for just 2 dollars?! That's a mere dollar each! Wouldn't you want to win this set? I just hope that I remembered to set aside some fabric to make myself a bag! So if you live in the area, or if you're planning on visiting the island on August 17th, or going to be in the 'hood anyways, I hope you will check out Fibrations. Please note that admission is free!! If you do make your way over, I hope you will stop by my booth and say hi!